Welcome Exhibitors! Explore and discover online tutorials, unique trade show accessories, and hundreds of trade show booth design and style options to keep your sales & marketing gurus happy. We are a 30+ year old Seattle-based provider of displays and supplies for trade shows, and have helped many thousands of clients find their perfect solution. May we help you find displays and supplies for your next show? We are proud to bring incredible variety to the table by being an independent distributor for almost every US exhibit and trade show display manufacturer. You name it – we’ll find it. We work with global clients, shipping displays and supplies across the US and around the world. We guarantee our customer satisfaction. This means we live by the golden rule – we all shop online these days, and we all want to be treated with respect, in a fast and efficient way. Our trade show display store and showroom was located on the Eastside of Seattle for over 30 years. In September 2018 we moved an hour drive to the west, to a more cost effective, but still spacious location at the Bremerton airport. Yes, if you're a private pilot, you can fly in to visit us now! Our goal is to provide fast and friendly service. We work to offer very competitive prices on the best supplies and displays that we can find. We try out all of our convention supplies ourselves, before recommending them to you. We only offer the highest quality trade show exhibits and ones that we would be comfortable using ourselves. We keep looking for the best displays and supplies and the newest ideas. This allows us to provide a one-stop solution for all your booth and exhibit requirements. You will get your own personal account executive to take care of your needs from start to finish. While we do have many members in the team working toward your goal, having your own personal executive means a lot less work and time for you in explaining your booth requirements. When you call, you will always be able to speak to that familiar member of our team. We also have some amazing graphics designers, both on staff and as partners, ready to help with exhibit and graphic designs. Our designers are professionals in wide format graphic designing and they know their stuff! We review your artwork, alert you to any concerns, and provide online graphic proofs at no added cost. We can provide renderings too, to help you visualize your new exhibit and how it fits in your booth space. One of our primary goals is for our clients to feel freedom in their selection when shopping our trade show displays. As an independent distributor, we work with almost every major US manufacturer and offer all of their best solutions. We also keep a close eye on the latest and greatest for the industry so that our customers can stay ahead of the game. Our vast exhibit network is sure to provide you with the style and feel you are hoping to achieve. We’ve grouped the main trade show supplies, booth ideas and booth designs, first according to size – floor standing displays, table covers and table top displays, and all other trade show supplies. The floor standing trade show displays are sorted according to the type of frame structure that used to build them. If you're not familiar with truss displays, then stop what you're doing and get ready to change the way you exhibit. Truss is one of the sturdiest frames in the world and have maximum modular freedom -- you literally get 100 exhibit displays in one! It’s easy to create completely different looks from the same group of parts. Show up fresh every time with this one-of-a-kind stunner. 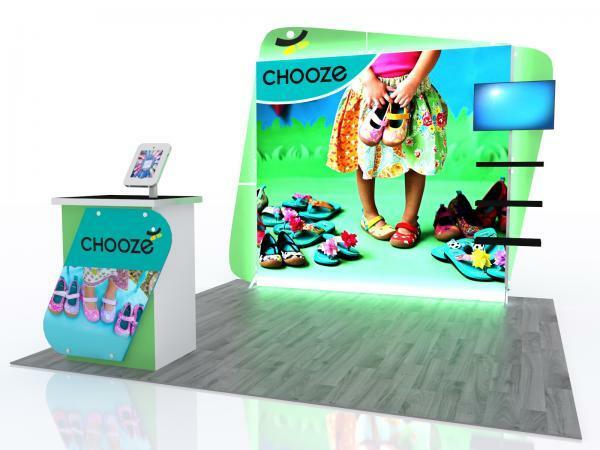 Hybrid modular displays are the latest development in the trade show displays industry. They use aluminum tube structures or aluminum extrusions, with dye sub printed tension fabric graphics. Named hybrid displays by some, others call them tension fabric or banner displays or modular trade show displays. Pop Up Displays all share one characteristic - they ALL have an expanding accordion frame. These accordion frames use either “carpet” panels or printed lambda mural graphic panels or dye sub printed fabric panels. 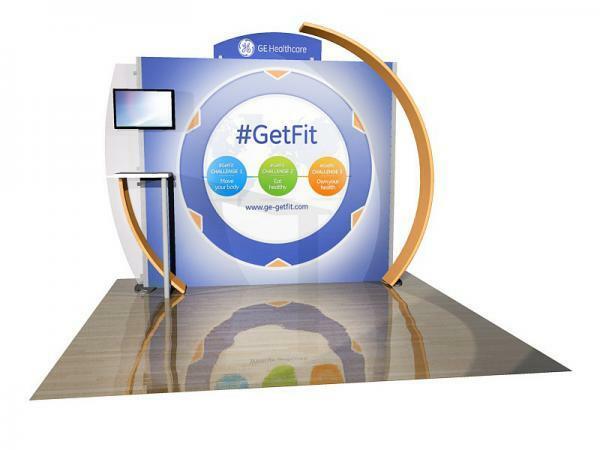 Panel displays are the 4th way to create trade show display boards and booth structures. And wouldn’t you guess, panel displays are all built around – yep, rigid or semi-rigid panels! All panel systems are modular, easy to reconfigure, and have been tested to last. These techy towers are making a huge impact in the trade show displays industry, allowing for full presentations to be elegantly delivered in an attractive, elite-looking unit. We offer the leader in Interactive Media Players -- the Blade -- as well as the Wave and InTouch lines to offer a range of versatility. Get connected! Xpressions and Salesmate table top displays are the pop banners of the tabletops. They weight 5-10 lbs, set up in seconds, and all come with lifetime warranties. They use dye-sub printed fabric graphics which stay on the frame unless you need to change or wash them (but they swap out in seconds). All the fabric graphics we offer are machine washable. The Ellipse and the Quadro QD use the same reliable pop up frame of the past, but with new, higher-end material. Both kits use an expandable accordion frame; the Ellipse uses an aluminum frame while the Quadro uses a steel frame (lifetime warranty). Panels use hooks to the top and magnetic side strips to attach to the frame, and can either be Velcro-receptive fabric or printed and laminated rollable graphics. Tensions Fabric, hybrid table top displays use aluminum extrusion frames and their tension fabric graphic panels to give a seamless, elite look. Their exotic, special look still comes on a lightweight, manageable display. Our popular Sacagawea and Segue hybrid fabric displays offer some of the best in table top looks. If you're looking for a smaller table top setup, we have several to accommodate your preferences, including the concierge which doubles as a display and a literature rack. The Showstyle briefcase display features a durable exterior with Velcro-receptive fabric interiors. This briefcase table top comes in three sizes. The graphic panels and header graphics, as well as lights, are all stored within the closed briefcase unit. The Fast Trak briefcase table top folding panel display also uses three panels. This is a lower cost unit than the Showstyle. It also offers Velcro-receptive fabric on both inside and outside of the panels, which are hinged together and fold up for storage. These come in 4ft and 6ft models. We offer a huge variety of minimalist, effective banner stand displays. All of these have sturdy construction, high-quality imaging, and a pole that allows for varying heights as you see fit. The graphics can be printed on vinyl or fabric. Retractable Banner Stands, also known as pull-ups, roll-ups, pop-ups, etc., are based on a wind-up, tension mechanism build inside of a long, slender metal frame. We offer non-retracting banner stands with the same, strong construction but without the tension; you simply roll these up and go! Also included in this category are the Twist banners which offer the same simplicity but these allow you to create one, interconnected look that flexes with the shape of your backwall. This category contains all things involving show and exhibit furniture, including a wide variety of counters such as fabric, back-lit, shipping case conversion counters, and truss countertops for your displays. We also offer trade show kiosks and workstations with charging ports. Folding trade show chairs and tables are available in styles such as wood and bamboo. We have many options in both counter and table height for counter-tops, and lots with optional graphics. We can also set you up with some custom-printed director chairs. The options are endless! Our premium trade show table covers are one of the most popular items in the industry, pairing beautiful with a matching table runner. They are made with 100% polyester twill to eliminate wrinkling almost entirely. 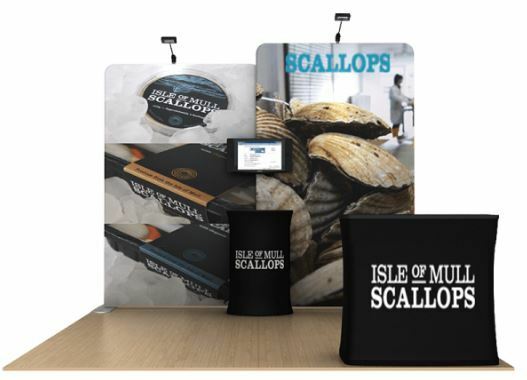 These can include logos and can be printed or unprinted with printing methods such as dye sub, screen printing, and vinyl heat transfer to make trade show displays stand out from the crowd. We offer both of these in 6ft and 8ft widths, and in styles such as loose, fitted, and stretch cover. These come with smoke/fire certification proper for show use, are machine washable, and come from an immaculate warehouse. We know that events are not limited to an indoor, comfortable setting with dry seats and air conditioning. So, we try to make things comfortable for you by offering displays worthy of the conditions. These include weighted, wind-driven, and even inflatable! There is no loss in cosmetic value either, being able to fully outfit most of these trade show displays with entire prints. Your trade show will be made in the shade! Trade show floors offer a great, hidden opportunity to wow your visitors! Many exhibitors settle for using the show rental carpet, and their trade show exhibits end up blending into the background. Flooring has an impact even in a 10×10 trade show booth – remember, that’s 100SF of potential advertising space! Take advantage of that space, and create a look and feel that stands out from the crowd. We offer Trade Show Carpet in either rolls or with Interlocking Carpet Tiles – carpet can be printed with your logo, and normally offers a much more comfortable flooring than the rented carpet – visitors will stay just to rest their feet! Interlocking tiles include simulated wood finishes and carpet finishes. Extremely lightweight, portable, easy to set up and inexpensive to ship. Base is built with 5/8” thick foam padding for comfort and shock absorption. Beveled edges are are also available. For exhibitors with a richer taste, we offer an incredible sleek, high-end wood flooring, raised flooring, and even raised flooring that is internally lit. If you're looking to sweep your audience off of their feet - these are for you. We also offer rolled vinyl flooring in many different prints. Rolled bamboo flooring is available for those eco-friendly exhibitors; these types can be extremely light-weight, great looking and still make you feel good about production. These are available in 5 colors with an optional shipping case. Printed full color felt carpet at 1/8" thick and 8oz backing is ideal for placing on top of unprinted carpet or other flooring, but also works perfectly by itself; this allows for exhibitors to essentially label the flooring with sectional categories and introductory graphics. These are vibrant in color and can be used in multiple pieces to create a larger area. Felt carpets are a great way to make a large impact with little flooring budget. 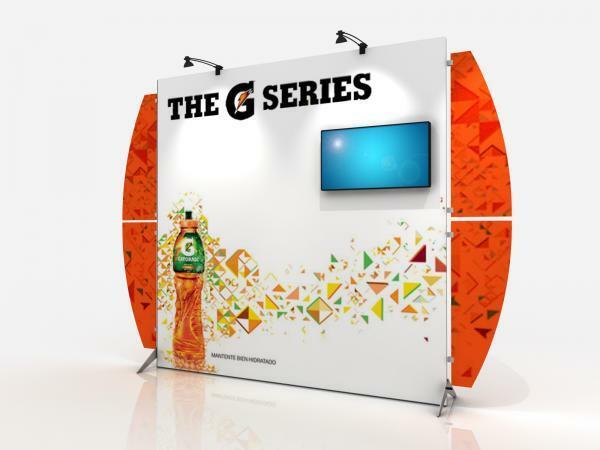 All of our exhibits and display stands are built for one purpose – to hold your display graphics, and show the world who you are and what you do! A large part of our service is providing new and replacement graphics for your booths and trade show exhibits. Our printing experts provide the highest quality dye sub trade show graphics printing and rollable laminated graphics, perfect for all of your events. Production turn-around for graphic printing is normally 4 business days; rush services are available. Whether you’re looking for replacement graphics for an existing display, or new graphics for a custom requirement – we can do it – just give us a call.